As Maarten’s research mainly focuses on the development of decision support tools, his research is located at the boundaries between the core - collaboration for innovation - and the ‘leaves’ of the “Communication in Adaptive Collaborative Social Networks for Innovation” model. 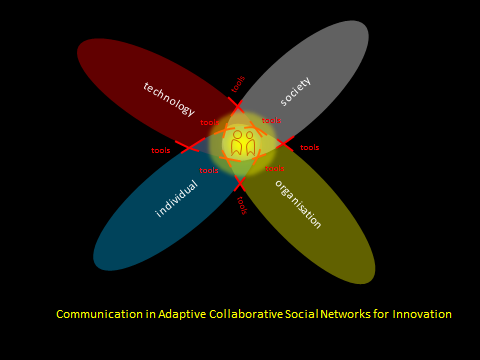 At these intersections (the red lines in the model) social learning processes take place and decisions are made by various stakeholders in processes of socio-technical transitions. Maarten is mainly interested in the social systems perspective of collaboration, which contains the so called micro-social order of collaboration for innovation and the according socio-technical trends in society. In addition to the development of decision support tools, Maarten’s research focuses on the ongoing development of the design method and pedagogy of communication for innovation design, and the according design-based research method. The latter leads to theoretical insights, prototype decision support tools and practical interventions. While carrying out his research in co-operation with professionals involved in socio-technical transitions, Maarten also started to develop a ‘form language’ as an alternative way of conversation amongst professionals to give meaning to the complexity of the issues at hand. 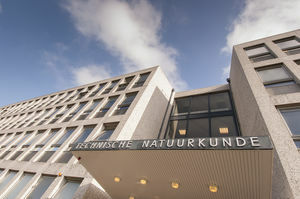 Since the educational and research program of science communication are intertwined in C-Lab, in which professionals, students and SC-staff co-research and co-design, Maarten and the students (minor & master) are involved in the development of innovative communication strategies and associated means.